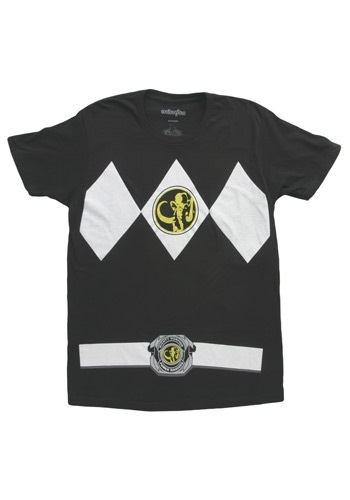 Black Power Ranger T Shirt By: Mighty Fine for the 2015 Costume season. No matter how many times you stand in front of the mirror and shout, "It's morphin' time!" you just won't transform into one of the Mighty Morphin Power Rangers. Why doesn't it work? Probably because Zordon didn't pick you to be one of the select few. He's super picky. Lucky for you we have plenty of Power Ranger t-shirts like this Black Ranger tee that makes the whole "morphin" process way easier. And you don't have to deal with Zordon or Alpha, so that's a plus!